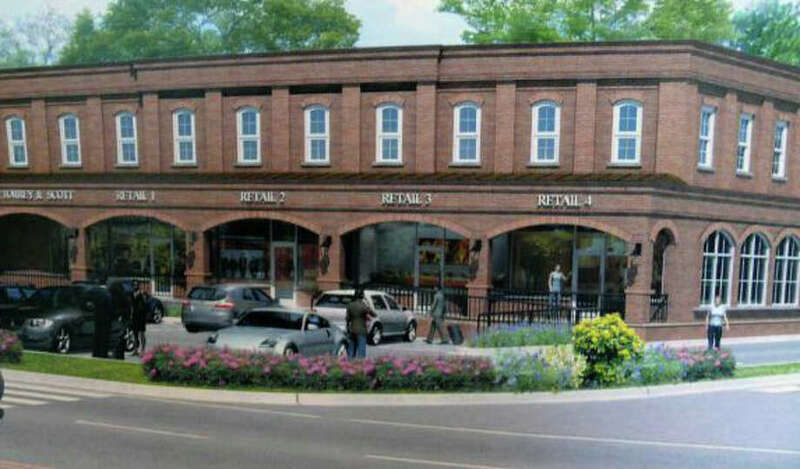 An artist's rendering of a brick retail/commercial buidling proposed at the corner of Post and Sasco Hill roads that was rejected Tuesday by the Town Plan and Zoning Commission. Plans for a retail/commercial building proposed as a replacement for a vacant, aging structure at the corner of the Post and Sasco Hill roads were unanimously rejected Tuesday by the Town Plan and Zoning Commission. "I think it's fair to say my client is disappointed in the decision," said William Fitzpatrick, the lawyer representing the applicant, One Sasco Hill LLC. The owners of the property at 2307 Post Road are B.V. and Torrey Brooks. "We will review our legal options and decide what to do," Fitzpatrick told the Fairfield Citizen. The plan for the half-acre site called for demolishing the existing building and constructing a two-story brick building, with parking in front as well as a parking garage beneath. Neighbors had opposed the proposal at earlier TPZ hearings, expressing concern about traffic generated by the project at a busy intersection they said already has traffic problems. "We applaud the effort of the developer to come forward," said TPZ Commissioner Matthew Wagner. But, he added, the proposal the zoning board received was appropriate for the site. "I believe the proposed development is an overuse of the lot. I have serious concerns about the parking and the safety of the arrangement they presented." The proposed building would have encompassed a total of about 12,000 square feet, with the first floor slightly larger than the second story. It also would have included a drive-through bank window. "The drive-through window will attract more cars than can park at the building," Commissioner David Soutar said. He said Sasco Hill already has heavy traffic because it is the route to two major traffic-generators -- Sasco Beach and the Country Club of Fairfield. Many of the neighborhood's larger homes also host community events, he said. The Sasco Hill-Post Road intersection, he added, "is definitely complex and problematic." For Commissioner Sally Parker, the brick building's design was also an issue. "It doesn't relate to the surrounding architecture of the neighborhood," she said. "I don't think it harmonizes at all with the actual site. It fills up every inch."